2008 Election Roundup – Yes We Did! Labor racks up big wins for working families in N.C. Together, the NC State AFL-CIO and Central Labor Councils supported a total of 102 endorsed candidates in the November 4th general election. Based on unofficial results, 85% of our candidates won their election. We endorsed a total of 12 candidates running for federal office. At the top of the ticket, Barack Obama and Joe Biden won with 49.7% of the vote. It’s the first time since 1976 that our state voted Democratic for president. Kay Hagan soundly defeated incumbent Elizabeth Dole to become the next U.S. Senator from North Carolina, winning by a 53% to 44% margin. 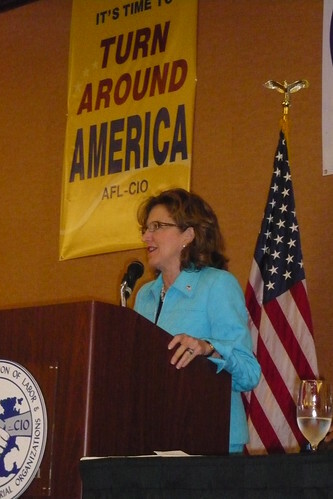 Toward the end of the campaign, Dole and her big business allies attacked unions and Hagan repeatedly for her support of the Employee Free Choice Act. Larry Kissell won a commanding 10-point victory over Robin Hayes to become the new Democratic Congressman in the 8th District. Kissell narrowly lost to Hayes by less than 400 votes in 2006. Kissell’s defeat of CAFTA sell-out, anti-worker, “liberals hate America” Robin Hayes is especially gratifying. G.K. Butterfield, Bob Etheridge, David Price, Mike McIntyre, Heath Shuler, Mel Watt, and Brad Miller each easily won re-election to the U.S. House. Not including Barack Obama and Kay Hagan, we endorsed a total of 17 candidates standing for election statewide. In the race for who will become Governor, endorsed candidate Lt. Governor Bev Perdue defeated Charlotte Mayor Pat McCrory 50.2% to 46.9%. Perdue is the first female elected governor in North Carolina. Our candidate for Lt. Governor, State Senator Walter Dalton won with 51% of the vote. Beth Wood, our endorsed candidate for State Auditor, pulled off a stunning upset victory over Republican incumbent Leslie Merritt, winning 54% to 46%. Incidentally, Wood will be our state’s first female auditor. Janet Cowell won her race for State Treasurer by the same 54-46 margin, making her the first female elected to that position as well. Wayne Goodwin defeated John Odom 52% to 45% to become the new Commissioner of Insurance. Roy Cooper, Elaine Marshall, and June Atkinson each easily won re-election, and John C. Martin, Cheri Beasley, James Wynn, and Linda Stephens won their elections for the Court of Appeals. In the race for Commissioner of Labor, our candidate, Mary Fant Donnan, narrowly lost to incumbent Cherie Berry 49.4% to 50.6%. We endorsed 54 state legislative candidates, of which 89% won their election. We endorsed 19 candidates in local and district court races, of which 95% won their election. Read the full list of results for our endorsements (PDF) .